Cryptoslots.com, the pioneer in cryptocurrency gaming created by Slotland, announces the launch of their newest game, and second release of the month, the new Deep Blue slot. To get you excited for the new game, and to give you some extra play time, Cryptoslots is offering you introductory bonuses for the new game, including up to 37% extra on your deposits. 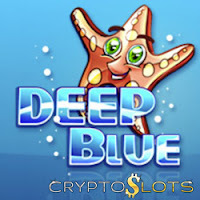 Deep Blue is a colorful new game where you can bet as little as one penny on one line or as much as $5 on all 11 pay-lines. The Double Starfish symbol is a Double Wild that can make for a whale of a win. Cryptoslots.com uses only cryptocurrency for deposits and withdrawals because it's fast, safe and transaction fees are lower than any other method. In addition to Bitcoins, Bitcoin Cash and Litecoins, players can now deposit and withdraw in Monero (XMR) as well. "Ahoy, matey, there's nothing fishy here!" laughed CryptoSlots manager Michael Hilary. "Well, except maybe a few seahorses, sharks and octopuses that is!" Available March 19 – 25, 2019 only. Min. deposit $45. May be used up to 2X per day. Wager 35X. Valid for all slots except Jackpot Trigger which is played using tokens won playing slots and video poker. Min. deposit $25. May be claimed up to 5x per day. Wager: 35x. Valid for new Deep Blue slot only. Cryptoslots now has 27 provably fair slots, 9 video poker games and one million-dollar jackpot game. CryptoSlots players automatically earn tickets for the casino's Crypto Lotto when they play slots and video poker. The lotto pays out a minimum of $10,000 every month.